I’m not above scavenging from other people’s garbage. Especially in my neighbourhood. My neighbourhood is a DIY-er’s heaven. I live in a neighbourhood where people throw out perfectly upcyclable items ALL. THE. TIME. I am not judging. If people want to toss these items instead of donating them or upcycling, that is their right. In fact, I’m glad they do because then I get these new objects FOR FREE. All they need is some Pinterest and elbow grease! (Just for the record, DIY-ers are not hoarders or junk collectors. We are visionaries and rescuers. So there.) I’m pretty sure that all my neighbours know that if they put something even remotely usable out on their lawn, I will most likely take it. And that is what this table was. Someone’s trash. And all I saw was potential. The table originally had the granite slab in the centre but the supporting wood was broken. I knew exactly what I wanted to do with this table because I have wanted a glass-top shadow-box type of table for a very long time. And it ended up being a very easy project to do. MinWax Special Walnut stain makes new wood look old and weathered. I wanted it to look aged, weathered and reclaimed so I chose MinWax Special Walnut. If you want a light-coloured wood or a wood that is in good condition to look like this, then this is the stain to use. It’s an absolutely gorgeous colour. The staining was easy. Brush it on (you can use a brush or a cloth; I used a foam brush), leave it until you think it’s dark enough and then wipe off any excess stain. 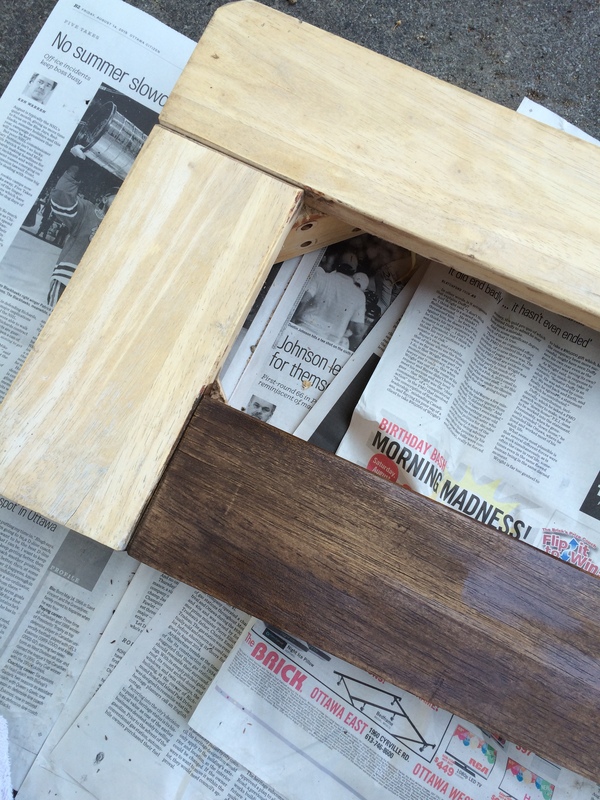 Make sure the stain is applied in the same direction as the grain and be careful that you don’t overlap on the corners too much or they end up darker than everything else. Because these pieces were sanded so well, the stain soaked in beautifully. Except where it didn’t. But the unevenness of it is part of what makes old pieces look old. 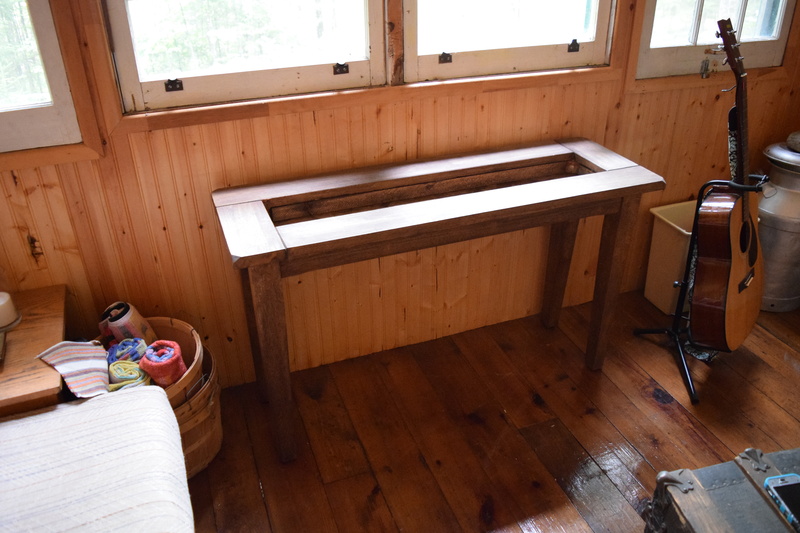 I stained the tabletop piece, the four legs, a piece of plywood that I had cut to fit in as a “trough” in the centre and four pieces that were to add depth to the trough. I cut the corners of this plywood so it would fit into the oddly-shaped tabletop frame. I stained the side that would be facing up, visible through the top. 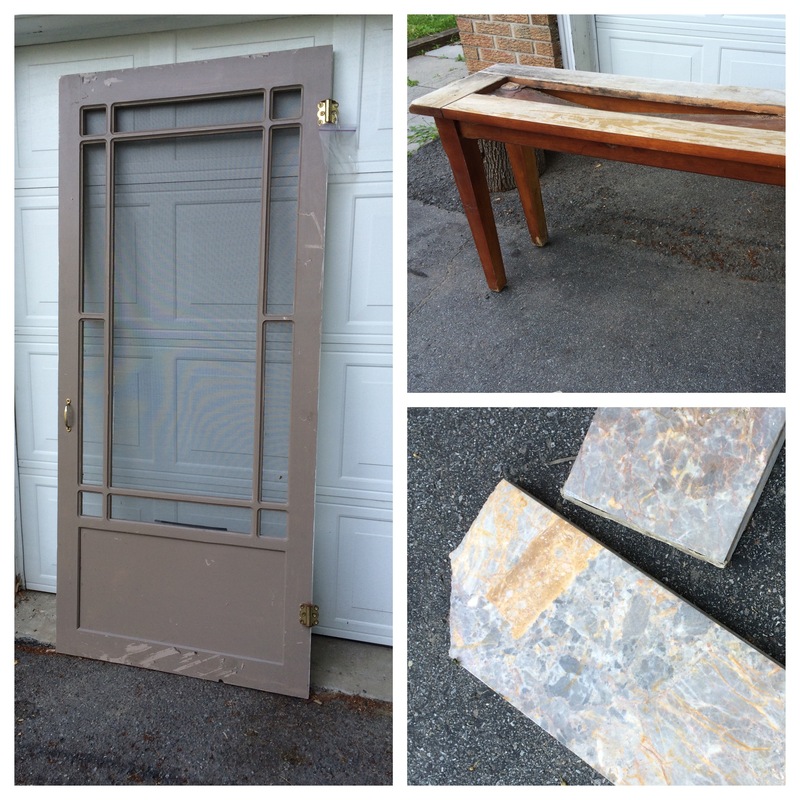 The plywood was a 2′ X 4′ piece bought at Lowe’s. I had them cut it to the size of the table opening. But the table has these triangular corners so I had to cut corners (literally) with the handsaw at home. 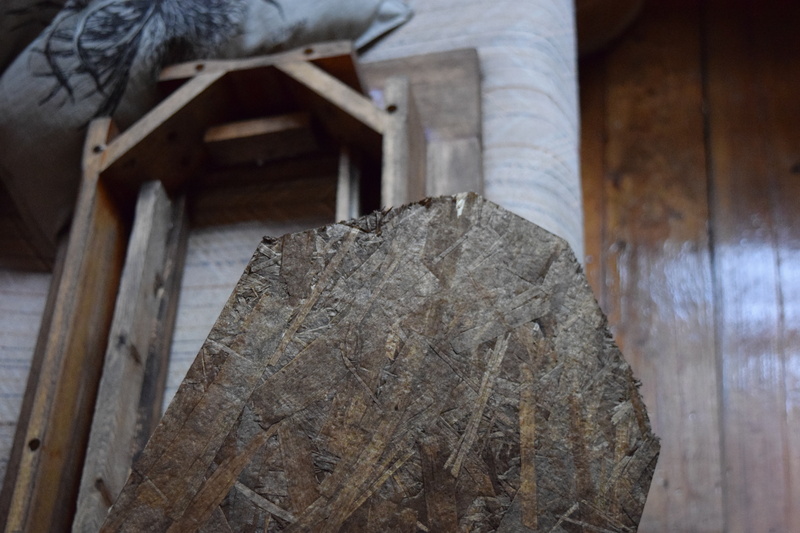 In our garage that is filled with pallet wood, other people’s old furniture and other stuff that I haven’t found a use for yet, I found some long, wooden pieces that were 1.5″ by .5″. I cut them to the appropriate sizes to fit inside the opening in the tabletop frame. 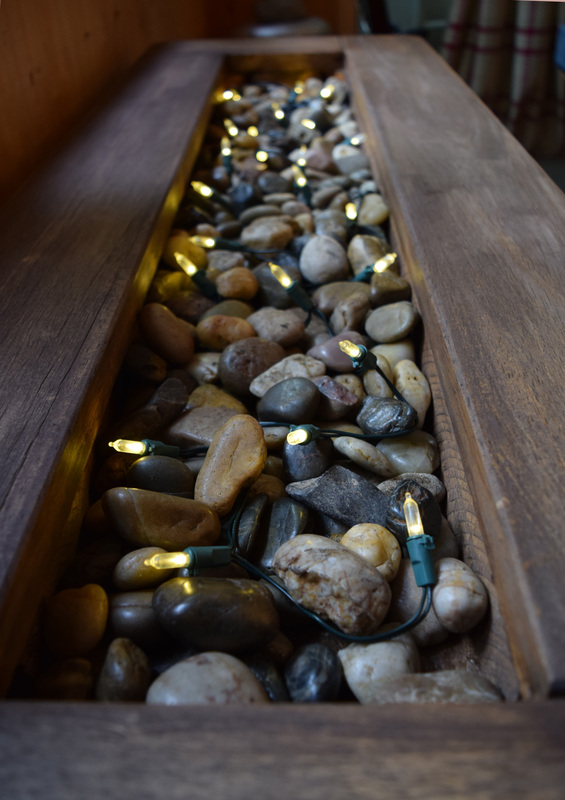 With the small pieces being 1.5″ and the tabletop itself being 1″, after the plywood is attached the centre will be 2.5″ deep, a perfect depth to hold river rocks and lights. 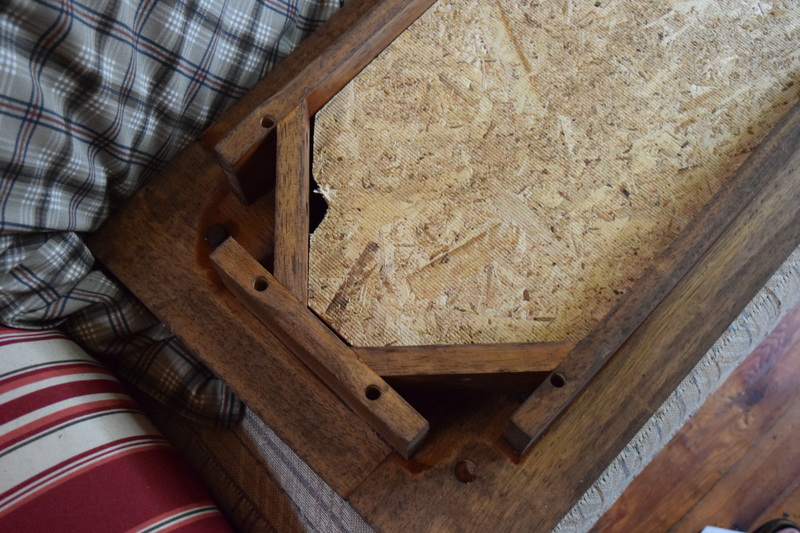 I cut pieces of wood to fit into the underside of the frame. The plywood will be attached to this so the centre of the table has a 2.5″ depth. I cut a small triangle out of the bottom because I needed to be able to string fairy lights into the centre part from below. Then I fit the plywood in and drilled the screws through the plywood, then through the wooden pieces and finally a half inch into the tabletop. I needed to make sure that it was going to be strong because of the weight of the rocks that it would hold. I also cut a small triangle out of the plywood so that I could feed a string of lights through the bottom without having to take the plywood off. I was finally ready to put the legs back on the table. One thing I highly recommend you consider before you get to this point – because I did not and it was pure dumb luck that I didn’t have to redo the whole thing again – is where the screws go to attach the legs. Remember how I said that Soldier Boy disassembled the table so he could sand it? Well, it never occurred to me to pay attention to where the screws for the legs go. I could very easily have gotten to this point and realized that the plywood actually crossed over or covered the holes. It was close. It was so close that I had that anxious feeling of, “Holy crap. Wow. That was really stupid. I almost completely screwed this up. But I didn’t. We’re good.” <lengthy exhale>. Here is the table assembled and upright. Now to fill it. Because we are at the lake and surrounded by nature in all its glorious beauty, I wanted to echo that theme in this table. Soldier Boy and I had decided when we first bought the cabin that we would keep the spirit of the cabin in mind when decorating. We wanted to create objects with natural beauty out of natural and recycled materials. Somehow it feels wrong to put something new or contemporary in our tiny, remote and rustic getaway. In the centre of the table, I put river rocks and fairy lights. The lights add soft light at night. I would have loved to find smooth rocks from the lake and fill the table with them. But let’s be realistic. That’s a lot of rocks. So, I found smooth river rocks at Dollarama for $1.25 a bag. I already had three bags leftover from a previous project so I bought 7 more. I filled the trough 3/4 full with the rocks. Then I fed the battery-operated fairy lights through the hole in the bottom of the table so the lights were inside the table but the on/off switch was under the table and easily accessible. I arranged the lights so the green power cord could not be seen. I can’t even remember where I got this string of lights but I do remember that I bought it at Christmas time years ago. There are approximately 25 lights on the string. Finally, the glass. This is one of those things that happened that made this project feel like it was meant to be. I had a glass tabletop from a small dining table that I had when I was in university. After years of it being in storage, I kept the glass and donated the minimalist table frame. I used the glass with a decorative firepit in my backyard for several years. When we moved house, the glass, which is 3/8″ thick and extremely heavy, slipped out of my hand. The corner hit the asphalt and broke off. Well, now it was useless because of the sharp edges. But we kept it. Because that’s what DIY-ers do. TWO YEARS LATER I find this table in a neighbour’s garbage and it is exactly the same length! If this is not justification enough to keep things that others see as garbage, then I don’t know what is. And the table is narrow enough that I can go to a glass-cutter and get the broken edge removed! Seriously, this is destiny. I went to the local glass and sign shop and after warning me that glass this thick and this old may shatter, he offered to cut it. To simply buy a new pane of glass this thick would cost over $175. To have it cut was $25. I love watching tradesmen do their jobs. They make it look soooooo easy. Within minutes, he had that pane of glass cut to the perfect size. And here’s the thing. He didn’t even cut it. He scored it and then BROKE it. Perfectly. With old skool tricks of the trade. Incredible. He polished the edges so it was nice and smooth and charged me the minimum. A total of $25 and 15 minutes of my time. 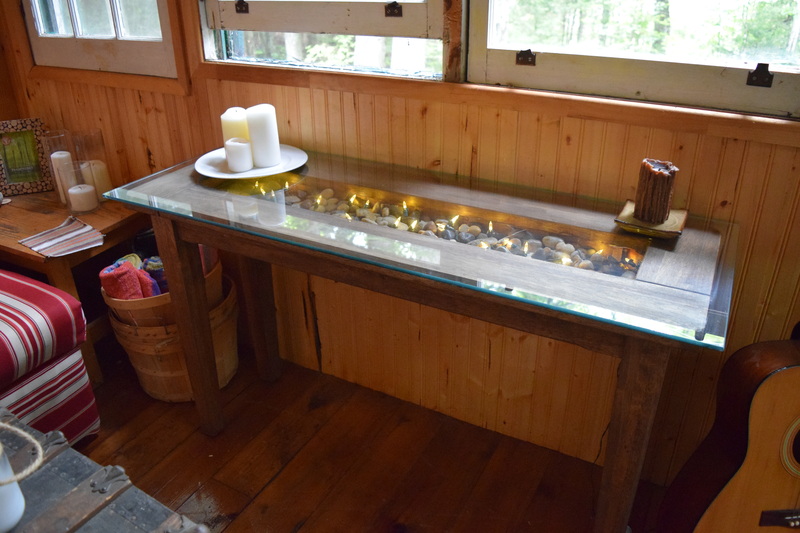 I cleaned it at the cottage (with two dogs, an 11-year-old boy and all the redecorating and construction tools and supplies we carry, our vehicle is incredibly dirty), placed it on the top of the table and we had a brand new, beautiful table. The glass is still very heavy and there is very little chance of it moving off of this table, even if accidentally knocked. 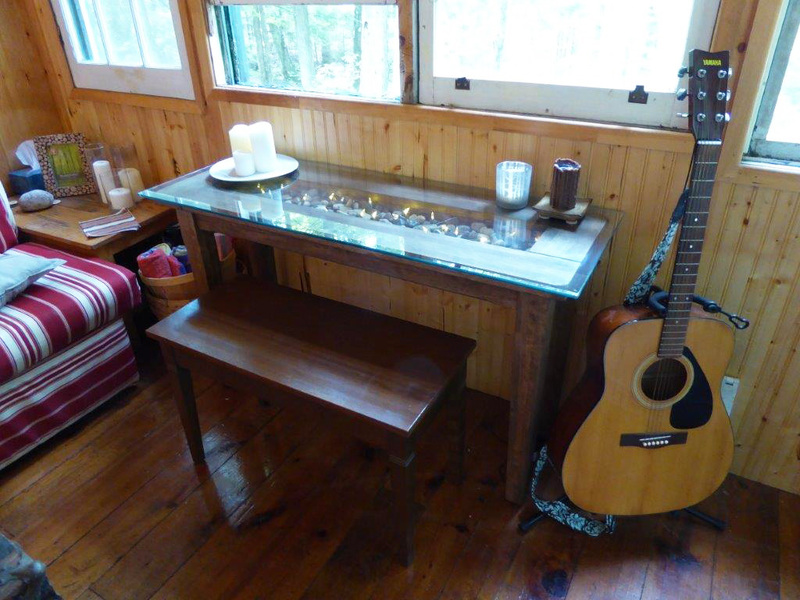 The table is wide enough to sit at and journal or have a morning coffee and look out into the woods and the marsh. It also makes the space look larger because it is less cluttered than the shelf that used to be there. And the finishing touch was when I emailed my Mom about the piano bench that I have at her place. Its dimensions fit perfectly under the table. This is what you want in a tiny house: a piece of furniture that doesn’t take up any additional space and it’s multi-functional. 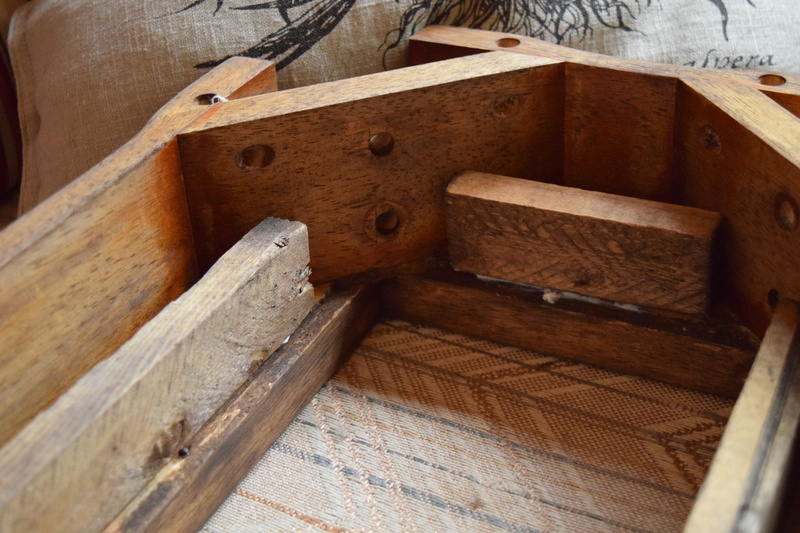 Things can be stored inside the bench (usually where one would keep the sheet music), it acts as seating for the new table and it can also fit two small people side by side if we need extra seating around the dining table. And if that didn’t convince you that this table was meant to be…the bench is made of …yep, walnut. It’s almost exactly the same colour as I stained the table. Now that it’s finished, I make any excuse I can to sit at it and enjoy it. I am in love. Definitely my favourite project so far. Here is the table with the piano bench. Fits perfectly. piano bench: an incredible gift (along with a piano) from my Aunt Wendy thirty years ago. Total cost: a generous aunt, a hoarder’s garage (ahem, I mean “a visionary’s work space”) and $54.63.